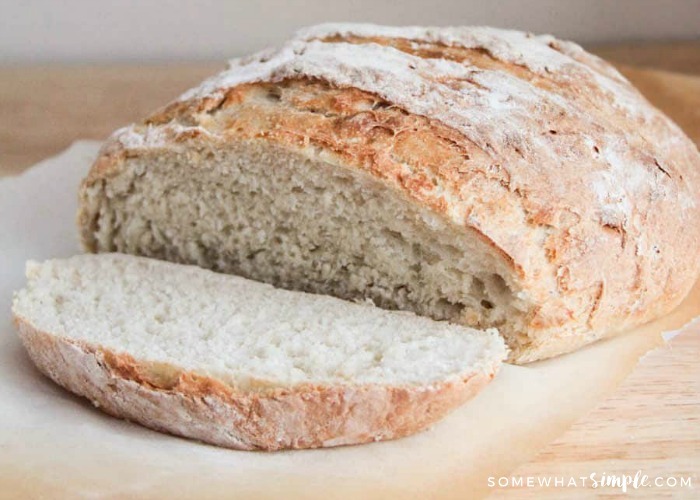 Are you looking for a delicious no knead bread recipe? This crusty Artisan bread recipe comes together quick and easy without all of the extra work! I love serving bread with virtually every meal I make. Whether you’re dipping a slice in a warm bowl of Albondigas Soup, making a Caprese Sandwich or smothering it in Whipped Honey Butter, this bread recipe handles it all like a champ! I am a huge bread lover, and would prefer a piece of fresh-baked bread to pretty much anything else… even dessert! 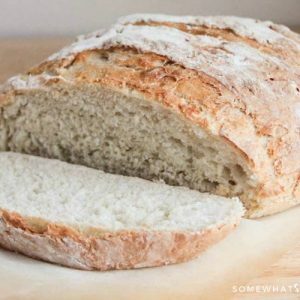 I’ve been experimenting with bread recipes a lot during the last year, and have found a few fail-safe recipes that always turn out well. 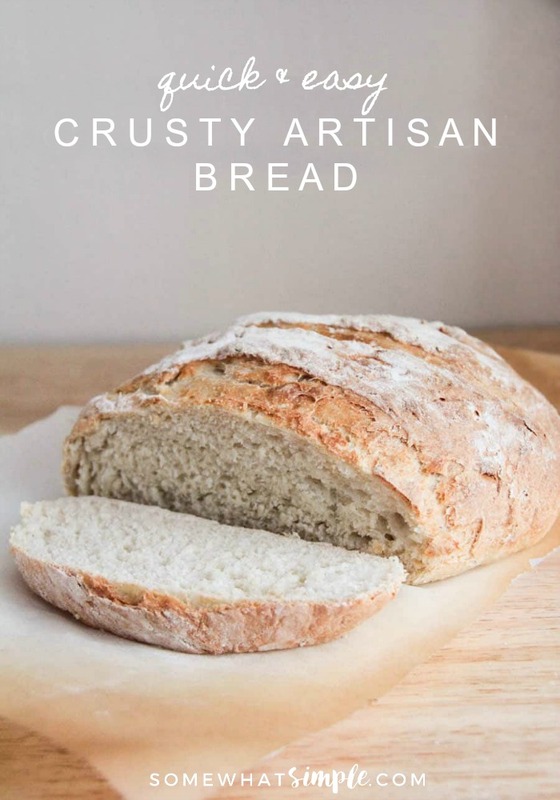 This quick and easy crusty artisan bread recipe is now one of my favorites! You start this artisan bread recipe out by first adding yeast and salt to warm water, and letting it proof. Then you stir in the flour to make a very loose dough, and let it rise. 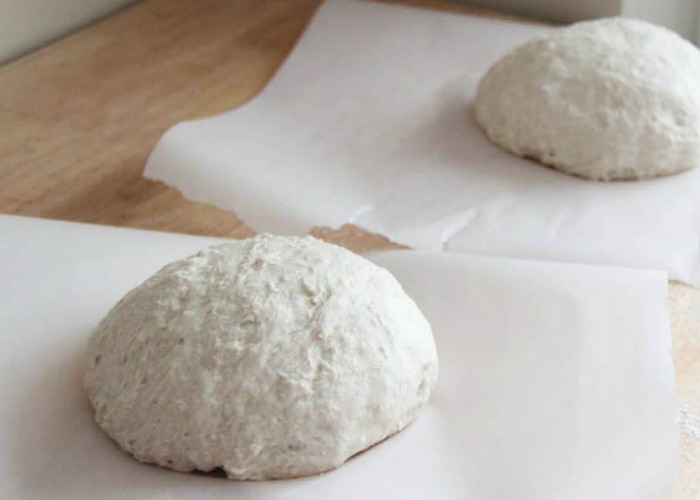 It will look different than your typical bread dough, but that’s okay! After it has risen, shape it into two sticky balls, and let them rest on parchment paper for about 40 minutes. Preheat your oven to 450 with a pizza stone inside. If you don’t have a pizza stone, you can use a cookie sheet turned upside down. On the shelf below the pizza stone, place a broiler pan or cake pan. When the dough has risen again, dust the top with flour and cut three deep slashes in the top with a sharp knife. Using a pizza peel (or a cutting board if you’re like me and don’t own a peel), transfer the dough carefully to the pizza stone. Pour 1 cup of water into your broiler pan or cake pan, and close the oven door quickly so the steam will stay inside. Bake 24-28 minutes, and enjoy! My favorite way to eat it is just slathered with butter (and sometimes a little honey). We also love dipping it in soup! My husband’s favorite way to eat it is to spread it with butter, sprinkle with salt and pepper, and toast in the toaster oven for a few minutes. No matter how you eat it, it’s this artisan bread recipe is delicious! 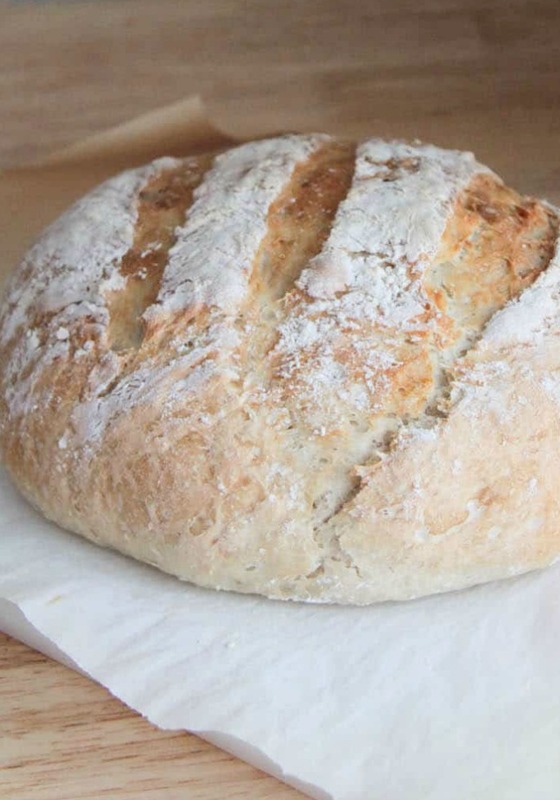 This really is a great no knead bread recipe! I hope your family loves it as much as mine does! Do you leave it on the parchment when baking? I tried baking your bread recipe. I hope you can help me. All was going well until I cut the slits the top of the loaves. The dough collasped. I put it in the oven as directed but it never regained any height. What do you think happened? Please help me, I’m married to a bread king. This is very similar to another recipe that I use where I preheat a cast iron (enameled) dutch oven and bake it. Comes out very crusty and delicious! I have varied the recipe to make raisin bread a I allow it to proof for about 12-18 hours on the countertop and it has an almost sourdough flavor. Thank you!! This was a great recipe to make (that didn’t require resting the dough for 8 hours) and both my loaves turned out beautiful! Saving this recipe!! 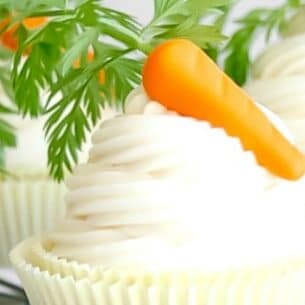 I found your recipe on Pinterest & tried it yesterday – easy & delicious! I wasn’t sure how it would turn out because my two dough balls almost completely collapsed during the second rise, they didn’t want to hold their shape at all! But I went ahead & baked them anyway on my stoneware pie plate from Pampered Chef. The first loaf was a bit underdone when I cut into it but the crust was excellent, so I just kept the second one in a bit longer (I think 30 min). Maybe you could add some tips for how to tell when it’s done? For a relative newbie to bread-making, I wasn’t quite sure what to look for. Thanks for sharing your recipe, though! Can I use my pizza stone instead? 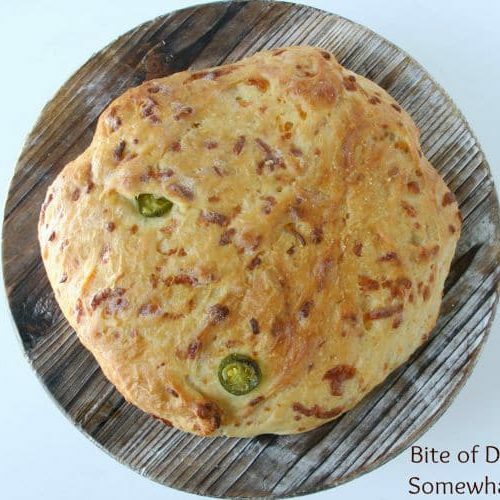 Im all out of yeast heading to store now and home to bake this with beef stew… just need to know if pizza stone plate will work also. Yes, the pizza stone works great. That’s how I always bake it. 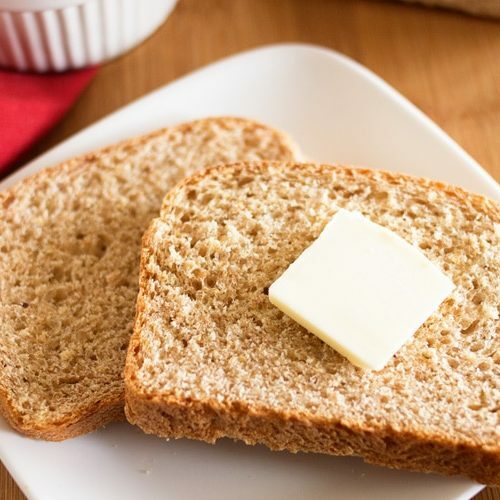 This is my favorite go to recipe for bread. It is easy and delicious! This looks great. Do you think it would turn out if I used white whole wheat flour instead of regular white flour? Just came across this on pinterest. I am anxious to give it a try. Thanks for the recipe. can i use a cast iron pan instead of a pizza stone? does this mean the lowest bottom shelf ?? also, why do you need a pan on the top shelf ?? The pan or baking stone on the upper shelf is to actually bake the bread on. I always use my baking stone but you could also use an overturned cookie sheet. It needs to preheat in the oven so the bottom of the bread will be nice and crusty. The second pan (on the lower shelf) is to put water in so the oven will fill with steam and make the bread chewy. I only had 1 packet of Rapid Rise Yeast (about 1 Tbsp), so I cut the recipe by 1/3. I also used half whole wheat and half white flour, added a little extra water, and about 1tbsp of honey. Only had to bake it about 22 minutes and it started to get too brown. I didn’t have the steam effect due to that and the oven temperature reduced to about 400 while I was trying to clean up that mess, but the bread still turned out to be delicious! Perfect recipe for an inexperienced bread maker! So I am at the second rise stage right now, and I can tell you that it is impossible to form this stuff into a ball, it just kind of is a blob. I definitely put in the right amounts of everything, maybe it just needs more flour in the recipe. Also, it stuck to the parchment immediately. Oh my…I just made this and it is the BEST bread I have ever tasted. I brushed on a layer of olive oil, sea salt and garlic to form a tasty crust before and after baking and it is amazing. I have eaten 2 pieces already! Thank you Alicia for such a wonderful recipe. It will be my go-to bread recipe for my next soiree. Can you use bread flour for this one? Thanks! I haven’t tried it personally, but I’m guessing bread flour would work great! 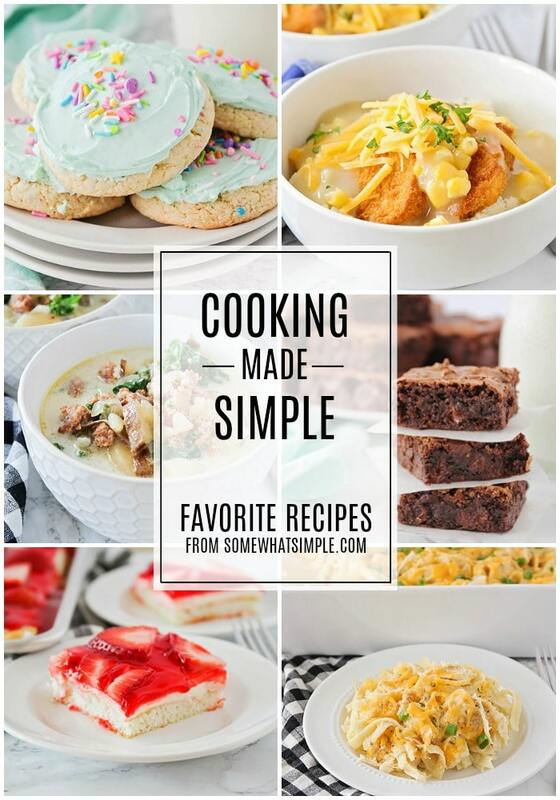 Love the simple recipe, one question. Do you back both loaves at the same time on two separate pizza stones (I have two, but they would have to be on two different levels of the oven)? or just one at a time? Not sure my oven is tall enough. Hi Meleah! I usually bake the loaves separately, since I have a tiny oven and a small baking stone, but when I baked it at a friend’s house I was able to fit both loaves on her baking stone in the oven. They do fine, though, if you bake them separately. If you’re worried about the second loaf rising too much you can just keep it in the fridge while the first loaf is baking. Hi! Besides shaping the dough into a round ball, is there any kneading involved? Thanks! Nope, no kneading! That’s one of my favorite things about the recipe. 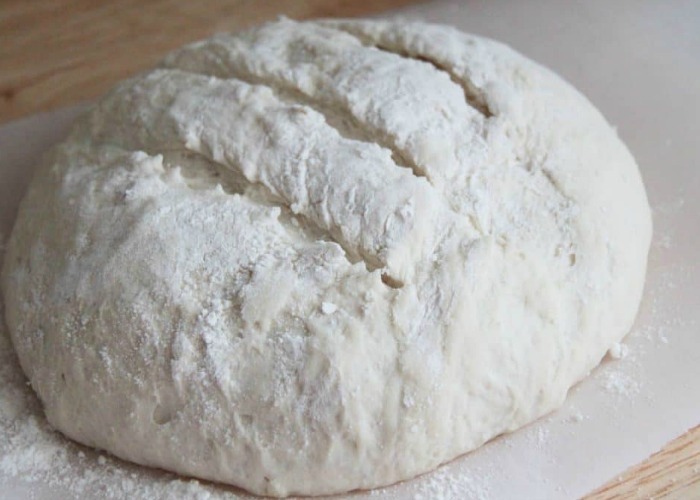 I usually flour my hands and flour the countertop to make it easier to handle the dough, but I like that it’s a little looser and stickier than a typical bread dough. Making bread always scares me, but this looks easy enough and super yummy!